Domeland. Text Owen Hatherley, photos David Secombe (5/5). 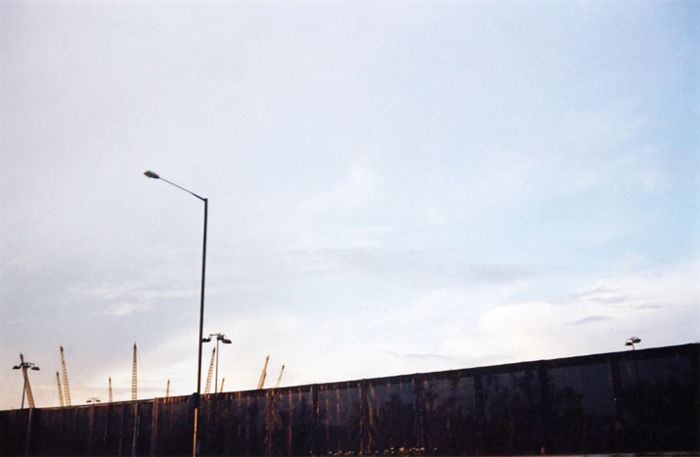 Posted: May 13, 2011 | Author: thelondoncolumn | Filed under: Architectural, Transport | Tags: blackwall tunnel, Greenwich Peninsula, Guide to the New Ruins of Great Britain, Owen Hatherley |Comments Off on Domeland. Text Owen Hatherley, photos David Secombe (5/5). The Dome seen from the Blackwall Tunnel southern approach. Photo © David Secombe 2004. This place was a Blairite tabula rasa. Faced with an area the size of a small town, freshly decontaminated and waiting to have all manner of ideas laid down upon it, what did they create – or rather, what did the companies and corporations that they subsidized create? A couple of areas of luxury housing (typically, with fairly minisucule apartments) a couple of shopping centres, several car parks, and now a gigantic Entertainment Complex to finally get those car parks filled. Amusingly, given that the area was once so keen to trumpet its eco credentials (a supermarket partly run on wind power), it has since become another of London’s locked traffic grids, as well it might having the Blackwall Tunnel nearby. Blairites, and neoliberals in general, have always posited some sort of ‘force of Conservatism’, some entrenched opposition either from the remnants of organized Labour or woolly traditionalists, that prevents their vision from being realized. Here, there was nothing but blasted wasteland when they got hold of it. Yet a more astounding failure of vision is difficult to imagine. If there is a vision here, it’s of a transplant of America at its worst – gated communities, entertainment hangars and malls criss-crossed by carbon-spewing roads; a vision of a future alienated, blankly consumerist, class ridden and anomic. The ‘corrosive humours’ turned out to be more difficult to erase than might have been imagined. * published by Verso. © Owen Hatherley 2011.